The MacMost.com Guide to Switching to the Mac by Gary Rosenzweig is a mass-market paperback computer book you can find online and in your local bookstore. It is a complete guide to using the Mac from the same people who brought you the videos and tutorials at MacMost.com. The book is for both the new Mac user, and for anyone who wants to get to know their Mac better and do more with it. The book quickly gets you comfy with your Mac, demonstrates the “Mac way” to perform every common Windows task, and shows how to do more with Macs than you ever could in Windows… way more! It’s all here — everything from choosing the right Mac to creating your own videos and DVDs. Rosenzweig covers the latest Macs and the new Mac OS X 10.6 Snow Leopard operating system. Best of all, he focuses on what today’s computer users need to know, including loads of coverage of using your Mac on the Web. Every Mac switcher needs a friendly Mac expert to show them the ropes. With this book, you’ve got yours! Navigate the Finder and learn how Mac files are organized. Make the most of the Mac’s built-in applications. Move your stuff from your PC to your new Mac. Use Safari, Mac’s great built-in Web browser. Set up Mac email, instant messaging, and audio and video chatting. Share, back up, and archive your files. Choose and use Mac business and productivity applications. Organize your music and buy new songs with iTunes. Import, manage, edit, and share your photos. Create awesome videos with iMovie, QuickTime, and iDVD. Run Windows on your Mac, if you must. Keep your Mac up to date and running smoothly. 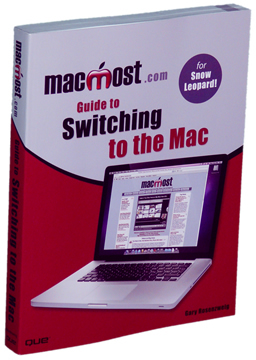 You can buy The MacMost.com Guide to Switching to the Mac at your local bookstore or online. You can purchase it at Amazon.com and have it shipped worldwide. If your local bookstore doesn’t have the book in stock, you can ask them to order it for you.